Recently, Creative has introduced a teeny tiny little screenless MP3 player that looks similar to the iPod Shuffle. The new iPod shuffle competitor from Creative is called Zen Stone. The Creative Zen Stone is a cute and tiny (only) 1GB mp3 player without screen display. It can support the WMA and MP3 format music and has an acceptable battery life of 10 hours from just a single charge of the built-in battery. 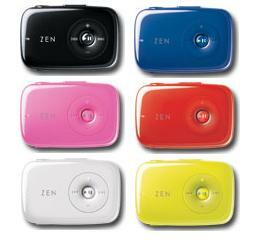 The Creative ZEN Stone MP3 player comes in a 1GB capacity that can store up to 250 songs for about $40.